Holot detention center filled to capacity with illegal African migrants; nearly 3,000 illegals left in 2015 but problem still remains. 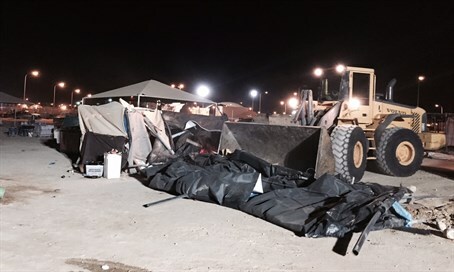 The illegal "commercial district" of the Holot detention center for illegal migrants was razed to the ground last night – highlighting the ongoing problem of the wave of illegal aliens in Israel. Two dozen structures – mostly poles and roofs – were bulldozed in a night operation in the Negev, by order of the Ramat HaNegev Regional Council. The area had been used as an illegal commercial center by the illegal aliens. Some 3,000 illegal aliens are being held in the Holot center, for lack of a better idea of what should be done with them. They infiltrated into Israel from Africa – some because of civil war unrest and others simply in order to find work. Their detention there had been for up to 20 months at a time, until the Supreme Court ruled last summer that this arrangement is unacceptable. A new law is nearly ready by which they will be held there for only 12 months, or 18 in some cases. Nearly 3,000 illegals left Israel altogether over the past year, including 507 just in November. However, many of those who have left Holot remain in Israel. They are not officially permitted to make their way to Tel Aviv or Eilat, where high concentrations of illegal migrants from African countries have made life very difficult for the residents and increased violent crime rates significantly. For instance, when southern Tel Aviv residents demonstrated against the Supreme Court decision, they ended up clashing with the Africans, some of whom yelled out, "This is our city and our home!" The ban on entering Tel Aviv is only partially effective. In one reported case, several illegals entered the city, were stopped by city inspectors, and were told to leave Tel Aviv within a few hours. It was not reported whether the migrants adhered to this order. Others didn't even try for Tel Aviv, but made their way to Ashkelon and Ashdod instead. Still others headed for Arad in the eastern Negev; they had been warned that they would not be permitted to enter, but in the end, no one stopped them. A percentage of the workers are more than welcome in Israel. Recently-resigned Interior Minister Silvan Shalom decided last month to allow 3,300 caregivers whose five-year work visas had expired to remain in the country. "When a healthy person becomes dependent upon disabled and dependent upon others, this is difficult enough," Shalom explained his decision, "and taking away the care-giver who may have been with him for years would cause even more harm."